Situated on Cornwall's south coast, Mevagissey is one of Cornwall's most beautiful fishing villages. The fascination with Mevagissey can only be understood with a visit here. Its narrow streets (where you'll find the cottage) allow the unique character of this quiet fishing village to live on. The fishermen are still here, hauling in their catch at the end of the day. You too can go fishing on one of the deep-sea angling trips that are available from the quay or short mackerel fishing trips in the bay. Mevagissey is a great base for a walking holiday with the Cornish coastal path passing right through the village. Close to the village are several other smaller villages incl. Gorran Haven and Pentewan. Mevagissey is right on the doorstep of the renowned Heligan Gardens and Eden Project. For the keen golfer you can reach many excellent courses and close by are Par and St Austell. The cottage has been in our family for over 50 years. My brother an I jointly own Erin Cottage (named after my Grandfathers fishing boat - a lugger called Erin), the cottage has been in the Elvins family for many years. William Elvins our Grandfather and our dad Brian Elvins lived in the three story house next door. Our dad was a history teacher at Kings of Wessex School in Cheddar. We still have many friends and relatives living in Mevagissey. The property is situated in a quiet side street opposite a church, on the flat part of Mevagissey and only a two minute walk to the harbour and main shops, pubs and restaurants. Mevagissey is also centrally placed in Cornwall making it a ideal base to visit other parts of Cornwall. Upstairs bathroom with toilet, bath and electric shower. A modern electric water heater and 15 litre tank has been installed in 2009. 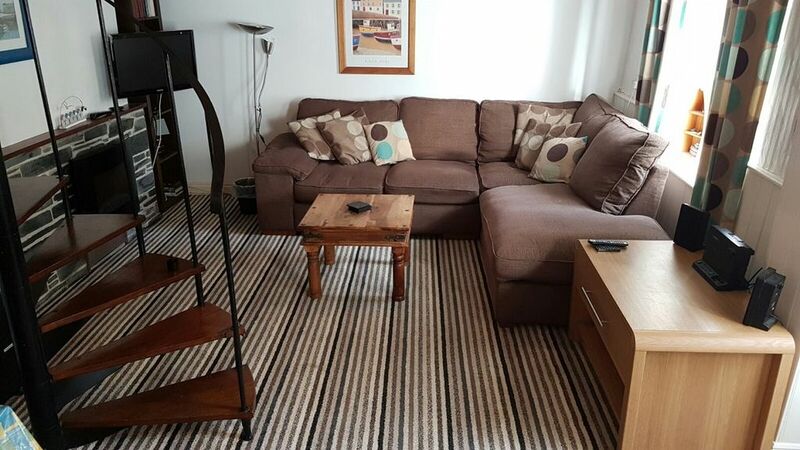 Downstairs open plan with a lounge area with colour flat screen Freeview TV, DVD player, CD/radio/cassette music system, settee and easy chairs and dining area. The kitchen is open plan with new integrated (cooker/fridge) units installed in 2011. Dining area with new x4 dinng table, toaster and microwave etc. For the keen golfer Mevagissey is centrally placed to reach many excellent courses, and close by are Carlyon Bay, Porthpean, St Austell and Lostwithiel, within 30-40 mins drive you can reach Llanhydrock, Bowood, St Mellion, Looe, Newquay, Perranporth and Truro. Notes on accommodation: The cottage has no parking spaces but it is possible to park outside in order to unload and there are two public car parks within a short walking distance from the cottage. Including Sunnyside car park is only 40 yards away. Outside: The property has no garden it is not suitable for pets. Utility Room: The cottage downstairs has been completely re-furbished & updated in 2011 and has a wonderful spiral staircase to the bedrooms and bathroom. Full double-glazing, along with new carpets, sofa and a new kitchen. Cleaning / Towels / Linen / Maid service: All 3 beds have duvets. Visitor's will need to bring duvet covers (double and 2 singles) pillow cases, bottom sheets and towels. The cottage is cleaned weekly. Electricity is on a coin meter (£1). Other: The cottage heating is mobile oil filled radiators and a electric flame fire. The booking process was quiet and painless, good communication throughout. Happily stay again when revisiting Mevagissey. We were not aware of the separate electric charge. Im sure it probably does mention on info but it isn't made clear. Locals were mostly friendly and as a gay couple we were treated no differently. This isn't always the case everywhere we visit. The cottage was adequately clean. Rather a lot of confusion over payment. Friendly owner. Beautiful area. Great pubs , especially the fountain which i thoroughly recommend , great food. The cottage was small but had everything we needed. It catered for us perfectly and was in such a great location. Mevagissy is a lovely area and has many gorgeous beaches so the cottage was a perfect base. Kitchen had everything needed, sofa and beds were comfy and shower was hot and powerful. All in all a great find and stay for us. Thanks! Erin cottage had a lovely authentic feel to it, indeed the quiet street just off the harbour was quaint. Opposite the church we were privileged to listen to the Mevagissey male choir practising on Monday night. We walked to Gorran Haven, Lost Gardens of Heligan, Charlestown, from Looe to Polperro and took the ferry to Fowey (seeing dolphins on route). Lots to do, great food , good public transport too. Erin Cottage is an ideal base, very clean and comfortable, I hope to return soon. Beautiful cottage with all the amenities you need. Stayed here for 6 weeks but would of liked to stay the whole summer. A sunny cosy cottage. What a hidden gem. Great location for village and harbour. Tucked away 2 minutes from the harbour, pubs and shops. Bit disappointed with the interior and furnishings. It's been a bit neglected and not as clean as it could be. With a little TLC this could be a perfect, cheap getaway. The beaches of South West Cornwall are simply among the finest in Western Europe and, some would argue, the world. Many sandy beaches are nearby including Gorran Haven and Pentewen. Also near to Mevagissey, reached from Gorran down narrow lanes is the lovely and quiet Hemmick Beach. Ideal for the family (about 5 miles away) is the Porthluney/Caerhays Beach which has plenty of parking, snack shop and the bonus of the beautiful Caerhays Castle. The nearest airport to Mevagissey is Newquay airport which is about 15 miles away. Alternatively Exeter airport is 1 hours drive away or Bristol Airport which would be 2.5 hours away. By rail - there are regular mainline Intercity services to St Austell with regular bus connections from the railway station to Mevagissey. For more details on train services from your area to St Austell contact the National Rail Enquiry Bureau. The nearest town to Mevagissey is St Austell which is 5 miles away. Truro is 12 miles, Newquay 15 miles, Falmouth 12 miles, Plymouth 40 miles. Eden Project - 5 Miles, Heligan Gardens - 2 Miles. Mevagissey also hosts its own festival (Feast week) the last week of June when the harbour is fully decorated, with a full week of activities finishing on the Saturday evening with a spectacular firework display around the harbour. Mevagissey also has its own museum, sealife aquarium and model railway centre. Other places of interest are The 15th Century Church at Gorran, Dodman Point, The Old Pilchard Cellars and Caerhays Castle. There is also a post office, bakers, grocers, chemist, numerous restaurants and pubs and takeaways and cash point facilities. Asda and Tescos supermarkets are located in St Austell which is approx a 10 minutes drive.